If you’re a Kohl’s cardholder, use code TURKEY30 at checkout to get 30% off and use code NOV4FREE at checkout to get FREE shipping. Also use code PLAYTIME10 to get $10 off your Melissa & Doug purchase of $50 or more. 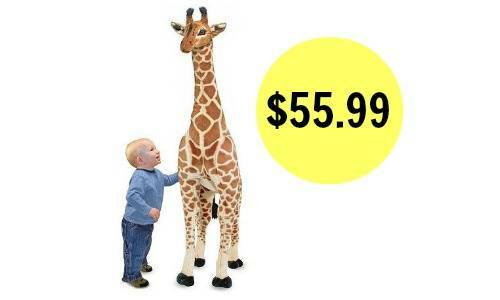 You’ll get the giraffe for $55.99! If you’re not a Kohl’s cardholder, you can use code VETERAN (through 11/15) to get an extra 15% off your purchase, making the giraffe $67.99. Choose FREE in-store pick-up to avoid shipping costs. The 30% code is valid through 11/16. The $10 off code is valid through 11/14. The free shipping code is valid through 11/17.